An examiner of USPTO hosted an AMA (Ask Me Anything) session on Reddit where he and Reddit users discussed multiple patent-related topics. For the uninitiated, AMA or Ask Me Anything is a feature of Reddit similar to an online press conference. In general, someone specialized in a field or an influential personality hosts an AMA session where s/he answers questions asked by Reddit users. You can gauge the popularity of the feature from the fact that in the past, personalities like President Barack Obama, Bill Gates and Elon Musk hosted an AMA session. My background is computer science/electrical engineering, and I have a law degree with a concentration in IP law. I have written papers on a lot of patent topics, including software patents. I have worked for patent firms, and now I work at the USPTO as an examiner (I am relatively new to the USPTO). I work in the art unit that covers a lot of the Android/Samsung/Apple/Sony/et cetera patents that you see in the news. Most of the patents I have reviewed have been by big name companies. Topics like the benefits of switching to ‘first to file’ system, the definition of ‘published piece’ in the prior art, the future of software patents were discussed in the session. Here’s a rundown of top 11 questions from the session. 1. Do you see a future where software patents do not exist? Do I? Not really. Laws are slow to change, and we just had major reform. The courts generally nudge in a direction, and I doubt they would just go and invalidate all those patents. It would cause a lot of chaos, and a lot of big companies would not be happy. This is completely just my opinion, but over the next 10 years, you will see less and less “bad” software patents coming out. Why? Because examiners will have a body of prior art to pull from. There was a big problem where there was a complete void of any prior art that examiners could use, so they couldn’t reject even stupid stuff. 2. How do we define what is considered a ‘published piece’? Given that anyone can publish anything in this age on the internet, through any means, how can an examiner reasonably discover whether prior art actually exists for a claimed invention? It’s obviously not feasible to look through every piece of code or scour the entire web looking for something that may have been done already. And in the case that there is prior art on the web, how can an examiner prove that the date of publishing is prior, or posterior to the date the patent application is filed? Given then pages can have their dates and content modified after publishing, and there is not really any archive or caching tool to prove otherwise, it doesn’t seem possible to assertively prove. You can go to the MPEP (there is probably case law too) on what is a printed publication (http://www.uspto.gov/web/offices/pac/mpep/documents/2100_2128.htm ). Definitely not limited to journals, printed publications is really pretty broad. The biggest problem is finding dates for things on websites, there often aren’t any, and if there are they may not be reliable (i.e. a wiki). We can use archive.org to try and prove dates, although that is not always reliable and may not have it archived. Which is why we tend to prefer journals/patents. When I search for prior art, I definitely use Google in addition to the USPTO sources. What assurance do I have that someone cannot later take my ideas and patent them? Time for Introspection: Click to find out How many Patent myths you believe in! Legally, they can’t steal something and patent it, although in practice the USPTO may not find the info, and it would require litigation to settle. What can you do? I am not sure what would be best. Disseminating the info, submitting it someplace to give it an official date. You could file a patent application and let it go abandoned, although that would cost money. 3. You have a software engineering background, but your opinion on whether or not it’s an obvious approach has no effect on whether or not the patent can be granted? Why does the patent office need to hire people with a software engineering background to look over this stuff, or it just a coincidence that you have that in your background? Pretty much; the problem I think is that letting us judge without journals/patents/etc. is that it is open to huge amounts of variance/bias. We are creating legal records, and a nice printed publication is something a person in the future can look at and say “Yes, clearly here it is, and they don’t deserve a patent because it is obvious”. We need engineering degrees because we are searching the prior art. The more you know about the field, the easier an application is to understand, and the easier it will be to find the prior art. 4. You mentioned that the definition of “obvious” is, well, not obvious. Can you please elaborate? You can search Google for “35 USC 103” for the full definition. Basically, we have 102 which is if I find 1 patent that covers all of an applicant’s invention. Then we have 103 which says “well, it hasn’t been done before (i.e. not all in 1 patent) but we can combine 2-3 patents making it obvious”. So basically “obvious” is combining a few patents together. There are of course various rules on it, but that is the basic idea. 5. What sort of training is the PTO giving you for the new opposition procedures? The USPTO has not started training on any of the new laws, so until we get that basically, it doesn’t exist. Same goes with new cases… there may be new Supreme Court cases, but until the USPTO updates the MPEP, basically it doesn’t exist for us. In the past, it wasn’t so much. Now it is becoming more and more common as we are supposed to help the attorney and work with them not against. If we have a question, or there needs to be an election or something like that, we can just give a call to help speed up the process. 7 (i) Reverse engineering is so easy for most competent engineering teams to do, especially in the software arena that the argument for patents with respect to disclosure of ideas doesn’t really apply anymore. (ii)Many patent claims are just obvious. (i) That is interesting, I don’t think I have ever heard that argument brought up before actually. I would say the other side is companies protecting their investment. Even if as a public policy we don’t need disclosure, economically from a business standpoint we do. Whether that is true in all fields like software, I am not sure. Software Patents is a tricky area and honestly, I go both ways on it. (ii) That would go to the patent laws, and what examiners can use to reject. Right now I think the tendency is to err on the side of giving a patent. 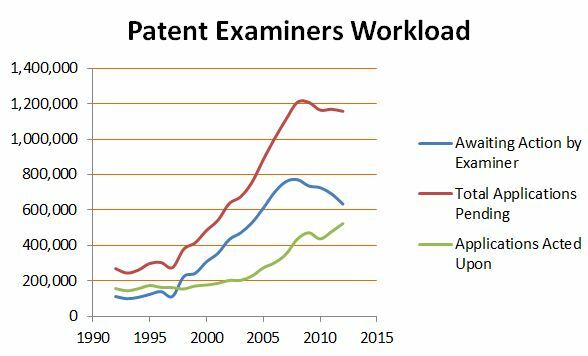 To go the other way you would basically change the entire patent system to require a much larger “gap” between patents… that is, a much larger improvement. Is that a better system? Would it even really matter? A lot of this is so theoretical it is really hard to know. 8. Your response to (ii) is interesting. Why is it better to err that way instead of the other? It seems to me that the responsible thing to do would be to not issue the patent if there’s doubt. It swings back and forth. Honestly, I don’t really know who has the power that decided that is. In past years the USPTO erred towards not giving. But the USPTO changed its policy towards being more applicant friendly, so now we go the other way and let the courts handle it if there is a problem. With the new AIA laws, the USPTO will be able to handle more of the issues that arise if there was a problem. The allowance rate is like 40-45%, so it isn’t like everything questionable is getting allowed. But as a trend, it seems to be the case. 9. You say that we’re switching to a “first to file” system in the next couple years. It’s troubling because it adds, even more, burden to individuals and small businesses that may not be able to afford to file patents, but did legitimately create the original invention. Your concern is valid. With every patent act that passes Congress, you have competing entities. Software wants the opposite of drug; big companies want something different from individual inventors and so on. The reason to switch to first to file is 2 parts. One, we’re trying to become more in unison with the rest of the world (we were the only ones that did first to invent). Two, it drives down litigation costs as both sides won’t be swearing behind each others’ work. 10. Do patent examiners ever put out a “request for prior art” announcement when they’re researching prior art? That seems like a good impetus for the competition to submit their documentation and less work on the individual examiner. We can make a request to the inventor, but in theory, they should have sent us what they have already. There is no real “prior art crowd sourcing” at the moment. I have seen people talk about it, and I am a bit mixed on it. On the one hand, it is an ideal type of thing to crowdsource, but on the other hand, most people don’t actually understand what qualifies as prior art, so it may end up meaning more work for the examiner. 11. If a patent is rejected, it can be reworked and resubmitted while retaining the original submission date. What mechanisms are in place to keep the applicant from simply adding claims from current innovations to their application, thereby giving them a retroactive lock on features they had no part in inventing? You are correct; there are ways to continue prosecution even if it is rejected. You can broaden/narrow/add new stuff/divide into multiple applications/etc., but the system doesn’t really let you cheat and use old dates for new stuff. If the information describing the current innovation was in their original specification, everything is fine and they have that original date. They may not have originally claimed it, but they did describe it, so basically they had invented it already and can capture it. This can happen when an inventor doesn’t know which part of their invention will really be the most commercially viable (very common). If they have to add the current innovation to the original specification (i.e. it wasn’t described originally), they do NOT keep their original filing date. However, if they have a mix of old and new, the different claims may actually have different dates, even though the patent only shows the one filing date. But that means the new stuff can be rejected with newer prior art. So there are definitely safeguards in place to prevent that sort of thing from happening. Did You Know: 90% of Patents do not make any money for Patent Holders? If you want to know why click here: Why 90% Patents Make No Money? Thanks for a good insight into some practical issues. Thanks for stopping by RK. I am glad that you found the post valuable.